Happy Friday booklovers one and all. 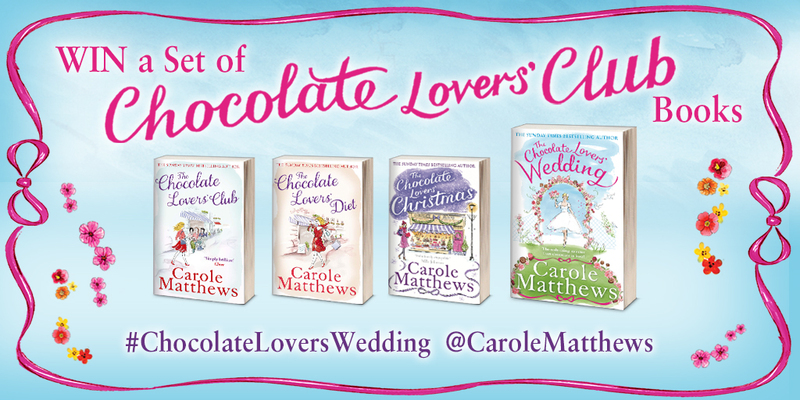 Today I am delighted to be part of the tour for the Chocolate Lovers Wedding by Carole Matthews. 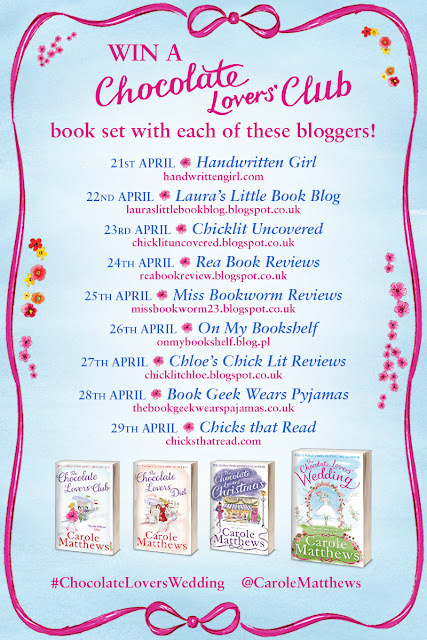 As with all the other bloggers listed below, I am giving you the chance to win all of The Chocolate Lover's Club books! Read on for more details on how to win! For a chance to win all of the below books, enter via the rafflecopter widget. This giveaway ends on Friday 29th April and is UK only I'm afraid. Good Luck! The Chocolate Lover's Wedding is available now. 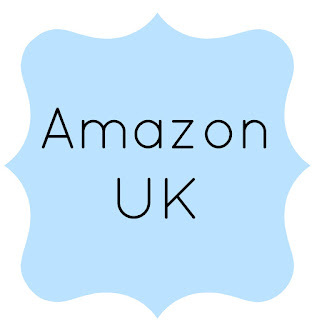 Carole Matthews is always a go to author when you want a great lighthearted feel good read. I have only read one of the chocolate series and would love to read more. Fab giveaway, thanks Laura, Carole & Little Brown. Oh, Joy! Rapture! What a lovely and delicious treasure! I love Carole Matthews, and I would love to win a set of her Chocolate Lovers Club Series. I cannot wait to read THE CHOCOLATE LOVERS' WEDDING. Lovely cover. Thank you for this fabulous chance. Happy reading and writing. I can't express why I want to win because it's such a fantastic prize I'm speechless! I love chocolate and I love Carole Matthews's books, so this is a fantastic combination for me. I have a UK address by the way :). I'm a big Carole Matthews fan, love all the books written by her. These books just look amazing! I haven't read any of Carols books but I keep seeing them everywhere and would love to read them. These look like a perfect holiday read and guess what I have a holiday coming up hehe! I would love to win this wonderful prize for my mom as she loves her books and reading.